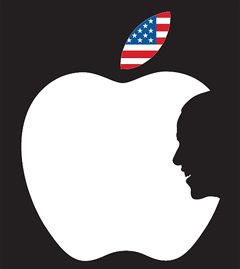 U.S. President Barack Obama on Saturday vetoed a ban by the U.S. International Trade Commission on the import of all Apple products that infringe rival Samsung Electronics' patents. It was the first time in 26 years that a U.S. president vetoed an ITC ruling, triggering charges of flagrant protectionism. "After extensive consultations with the agencies of the Trade Policy Staff Committee and the Trade Policy Review Group, as well as other interested agencies and persons, I have decided to disapprove the USITC's determination to issue an exclusion order and cease and desist order in this investigation," Michael Froman, a U.S. trade representative, said in a four-page letter to ITC Chairman Irving Williamson. Froman said the decision took into account the "effect on competitive conditions in the U.S. economy and the effect on U.S. consumers." Apple applauded the Obama administration for "standing up for innovation in this landmark case." Samsung Electronics in a short statement expressed "regret." Samsung and Apple have been locked in around 30 lawsuits around the world over the last three years. In one of them, the ITC in June sided with Samsung and ruled that Apple infringed the technological patents of the Korean electronics giant and banned U.S. imports of Apple's iPhone 3GS, iPhone 4 and iPad 2, which are assembled in China. The U.S. government argued that the issue of standard patents should be resolved through royalty payments rather than import bans. Industry watchers say the U.S. government sought to protect American businesses in overturning the ruling, a mentality that pervaded across American society even before Obama vetoed it. Four U.S. lawmakers recently sent a letter to the Obama administration urging "prudence" in signing off on the import ban. Major U.S. IT companies, including Intel, Microsoft and Oracle, also called on the Obama administration to veto the ITC's ruling. Others say the presidential veto reflects a fear of Samsung's increasing might. In the second quarter this year, Samsung sold 170 million mobile phones, more than No. 2 player Nokia (61 million) and No. 3 ranked Apple (32.1 million) combined. The U.S. gained oligopolistic control over the international IT industry, spearheaded by Apple, Facebook, Google and Microsoft, but feels increasingly threatened by Samsung's growing control over the global mobile hardware industry. 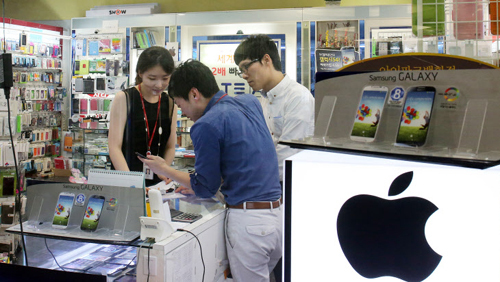 Shoppers look at smartphones at a store in Yongsan on Sunday. Analysts expect the veto to have both direct and indirect impacts on pending lawsuits between Samsung and Apple. Although the cases differ, the fact that the U.S. president has shown a clear intention to protect American businesses is sure to have a significant effect. All eyes are on the ITC's final decision on Friday whether Samsung infringed any of Apple's patented technologies. The Samsung products involved in that ruling are the Galaxy S, Galaxy S2 and Galaxy Nexus phones and Galaxy Tab 10.1 tablet PC. The ITC already reached a preliminary ruling in March that Samsung infringed four of Apple's patents. If the ITC bans imports of the Samsung products, Obama would face a storm of international criticism unless he also vetoes that decision.